Surf fishing is a widely populated fishing system from the beaches, shore etc and almost every highly fishing enthusiast person has the surf fishing enthusiasm. Although, you need the skills, tricks and techniques to be succeeded on surf fishing. But, the most compulsory equipment on the combination of surf fishing reel and rod is its large rod. On the other hand, the surf rod is longer than any other fishing rod while the equipments like the reel and line are more powered than other whitewater conventional reels and lines. Because, building up a strengthened combination of the reel, rod and line is the foremost requirement to fight with the bluefish, red fish, black drum and sea trout. But, handling such a rod from the beaches can be a little bit challenging for any fisherman and you can’t stand with your rod hours after hours if you don’t have the right equipment to manage it. So you need to securely set up it on the beach and once you set it up, you don’t need to struggle to control it. That’s why you need a strong and a large rod holder while kayak or boat rod holders aren’t enough to hold your large 12’-14’ large rod. So, you must deal with the specific surf fishing rod holders and on the market, you can buy a variety of fishing rod holders. But, that does mean you must spend the money to buy your very needed surf fishing rod holders. Although, you can apply multiple do it yourself techniques to build up these holders if you just spend a few bucks. So, after researching we have discovered several DIY surf fishing rod holder making techniques and you can apply these to easily build up your very needed surf fishing rod holders. The most simplest techniques ever discovered for the surf fisherman. 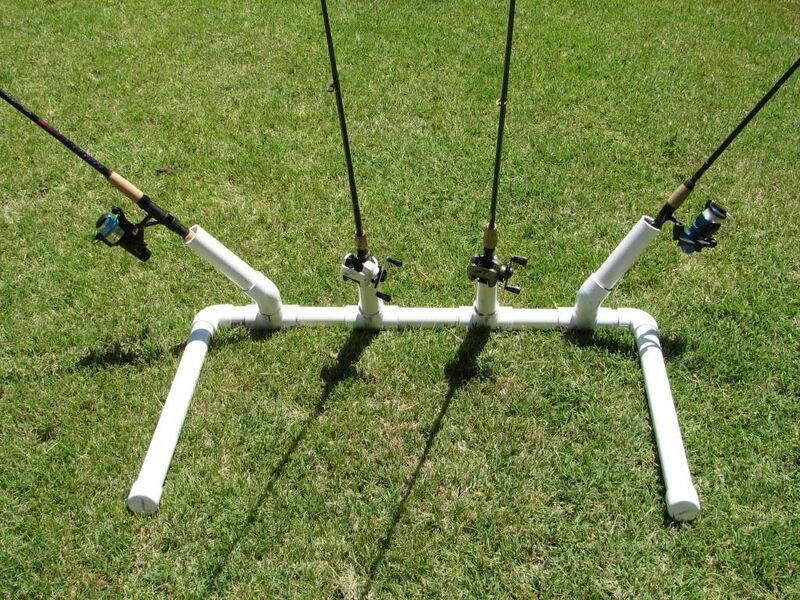 You can easily build up a fishing rod holder from PVC pipe. So, you need approximately a 3’ long PVC pipe with 1.5” to 2” diameter (or consider how wide the bottom or handle of the rod). After getting your PVC pipe you can use any end of the pipe to cut on 30 degree angle and make an edgy end. You can use a marker pen to draw an angled line over the end of the pipe and you can cut into the line by a hacksaw. While you are cutting, make sure the pipe creates a whety end. After cutting, you can use a sandpaper to blunt the sharp edges, so that it can’t make you injured or build any scratch over the bottom of the rod. Such a rod holder can cradle your rods, but you wouldn’t be comfortable to enter the pipe into the rocky beaches or touch surfaces. 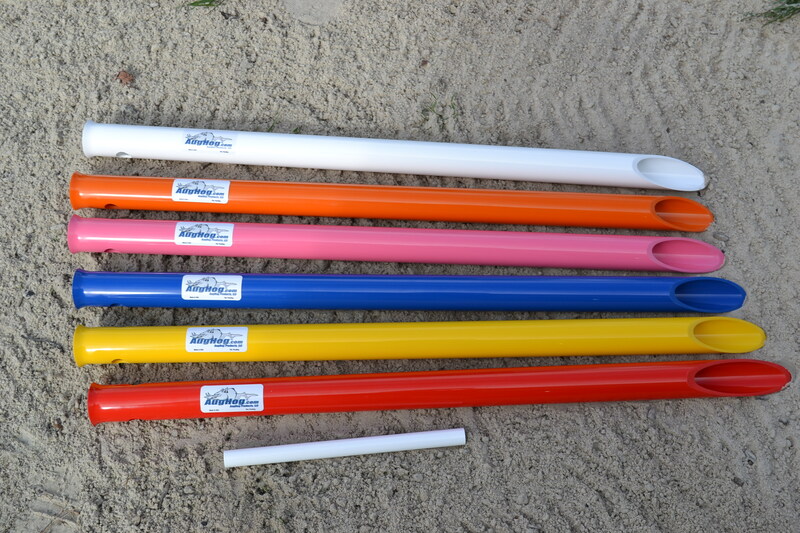 If you want to create a surf fishing rack rod holder from PVC pipe, we are offering you an idea to create such an easier rack holder from plastic pipes. Although you need the multiple plastic pipe connectors or fittings. So, you need two caps, two elbows, two tees and two wyes while you should cut two three feet long and one 4 feet long pipe to build up the structure. After sizing them, now you have to cut again the large 4 feet long pipe into 5 required pieces (make sure the first three pieces of the pipe are no longer than 1 feet and the rest two pieces are no longer 6 inches) and you must thread on every end of the pieced pipe including the large two three feet pipes. So it’s your time to build up the structure. So, adjust the fittings with following the picture. You might also need two 1 feet long pipes to adjust into the 45 degree wyes and there is also required to thread on any end of these two pipes. This is a unique idea to make the rod holders and the buddies on Dirty Hookers neatly explained it. You can use the aluminum pipe and angle to avoid the corrosion as the water on the shore tends to corrode the metallic equipment. So to create every piece of the rod holders, you need approximately a 3 feet to 4 feet long angle and two three inches long pipes. Basically, you have to create these pieces of pipes from any full bodied aluminum pipe and you need the drill, handheld cutter machine with metal cutting disc and sanding flap disc. A few nuts and bolts are also required to adjust the pipe with the angle. So, at first create two holes with 1.5-2 inches distance on two different angles of the aluminum or steel angle and follow the same distance and measurement to create the holes onto the pieced pipes. Follow the same method to adjust another pipe on one feet distance from the first one. To create an edgy end onto the end of the angle you may follow the way we used to do with a PVC pipe. These metallic rod holders can be easily put into tough surfaces. The video is also attached here.